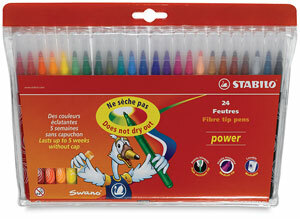 These robust markers with a ventilated cap can survive capless for five weeks without drying out. This makes them ideal for use by children who, in their artistic fervor, occasionally forget to replace caps! These markers have a robust, large tip with a line width of approximately 2 mm.